A few readers have asked for guidance on what work they should be carrying out on the green on a month to month basis. Now of course conditions across the UK are widely varied at the moment; some areas in the south are free from frost, whilst here in Perthshire we can have very hard ground and many days of minus temperatures, in the southern parts of the country things can be and often are a lot milder. the damage that could be caused to the turf and soil by actually doing this work. the snow is affording the turf some protection from the worst of the cold weather; see my article on winter green protection here. 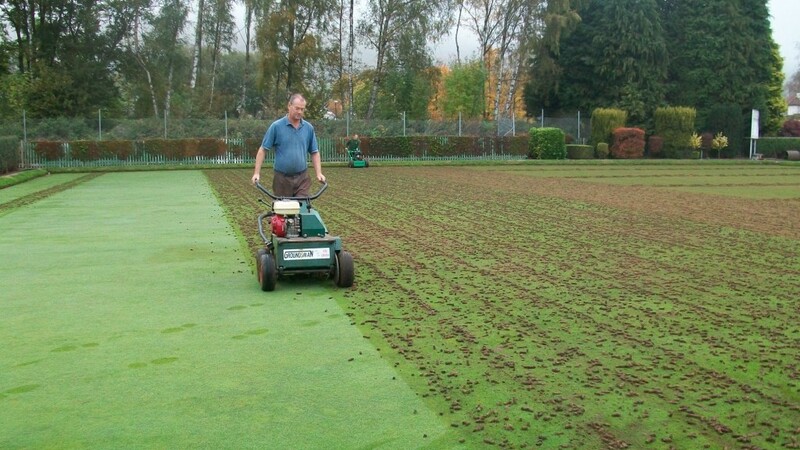 A couple of years ago we were hit by severe snow and ice in some parts of the country and it raised a few questions about how best to deal with severe winter weather on bowling greens. I am re-visiting this today as a timely reminder now that we are in the winter season. Hopefully this will be a good omen and we wont get any snow this year! The unusually early onset of winter in 2009 and 2010 created a few problems for most of us and seriously curtailed many winter maintenance programs. We received a lot of enquiries asking for advice on dealing with the snow and ice on bowling greens and the aftermath of deep snow cover. The main concern during and after snow cover is the potential for the outbreak of fungal diseases such as fusarium patch; and indeed, fusarium might well be encountered after the snow has melted. Although many clubs will have applied a preventative fungicide in the Autumn, this might not have provided total protection, but should have minimised the risk of attack. Many of the enquiries we have received have been related to the actual snow cover and clubs have been worried about the prolonged cover of snow and ice on their turf and have asked if they should be pro-active and do something to remove the ice cover. My advice would be to leave it and allow it to melt naturally. Attempting to remove ice could result in damage to the turf, soil structure and grass plants. Please also remember that even after the snow and ice has gone the underlying soil could still be frozen and any activity on the green could result in damage to the root system of the green. Please make sure that the green has completely thawed by probing the soil before commencing (and catching up) with your winter maintenance program. The diagram below shows the process that many poorly maintained bowling greens experience over a period of years if 3 basic maintenance issues are not addressed as a priority. 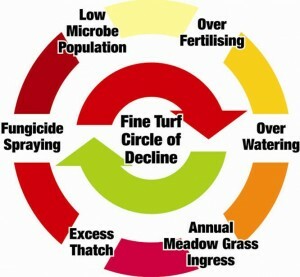 In addition to the top 3 there are of course other important issues such as irrigation management, topdressing etc, but if these 3 big issues are under-managed then the green will spiral into what I have called the Circle of Decline. Simply put this is the course of events that go on largely un-noticed by many bowling clubs until it is too late to effect a quick recovery. Grass relies on beneficial microbes, such as fungi to make best use of the available nutrition and so begins to have difficulty obtaining the necessary nutrition from the soil. This often results in over fertilisation, as much of what is applied is not made available to the plants due to the anaerobic conditions which now prevail. Action must be taken to break into the circle of decline, take action before its too late for your green.